This short hike is best done with snowshoes unless the trail is packed. Many winter hikes have limited parking, but you can park behind the Town Hall for this one. The loop is through a wooded area with a variety of hardwoods and softwoods, many animal tracks, and a brook that runs all year. There are also a couple of hunting perches. The trail has metal markers on trees, but you can lose track of them. You are mostly within earshot of route 113 so if you get turned around, you can hear your way out. This entry was posted in Ward Parcel on February 27, 2010 by madisonhiker. Snowshoes are the way to go since the last snowstorm. This trail meanders so much that skis would be awkward. There is a lot to see: tracks, trees, and tributaries along a fairly level walk of about three quarters of a mile. Breaking trail will be more exercise. See if you can find the structure built in the tree to wait for deer to pass. 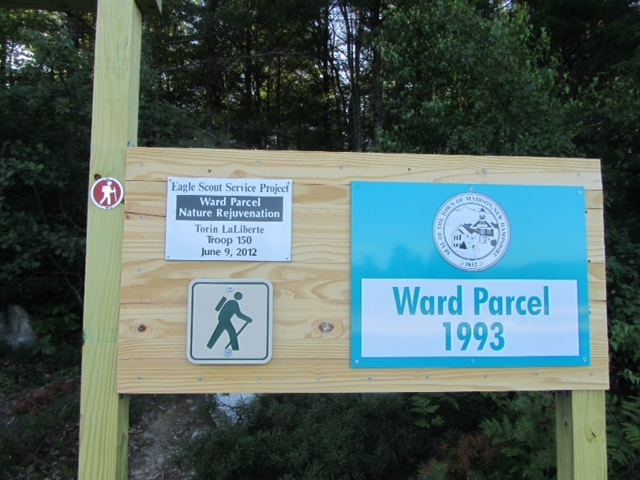 This entry was posted in Ward Parcel on December 18, 2009 by madisonhiker.